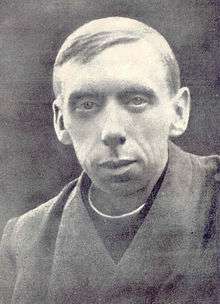 George Tyrrell, S.J. (6 February 1861 – 15 July 1909), was an Irish Jesuit priest (until his expulsion from the Society) and a modernist theologian and scholar. His attempts to evolve and adapt Catholic theology in the context of modern ideas made him a key figure in the modernist controversy within the Roman Catholic Church in the late 19th century. 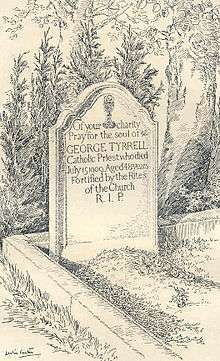 Tyrrell was born on 6 February 1861 in Dublin, Ireland, and was brought up as an Anglican. His father was a journalist who died shortly before Tyrrell was born. Tyrrell grew up poor. He converted and was received into the Catholic Church in 1879. He immediately applied to join the Society of Jesus, but was advised by the provincial superior to wait a year. He spent the interim teaching at Jesuit schools in Cyprus and Malta. Joining the Jesuits in 1880, Tyrrell was ordained to the priesthood in 1891. After a brief period of pastoral work, he taught philosophy at Stonyhurst, where he came into conflict with some of the faculty for not adhering to the traditional Jesuit approach to Thomas Aquinas, which was heavily influenced by the work of Francisco Suárez. 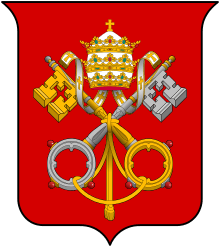 He argued that the pope must not be an absolute autocrat but a "spokesman for the mind of the Holy Spirit in the Church", the "Base Community" as he termed it, of the laity. He was suspended from the sacraments the following year and finally excommunicated in 1908. He died the following year, still considering himself to be a devout Catholic. Tyrrell was the only Jesuit to be expelled by a Jesuit general in the 20th century until the Spanish father general, Pedro Arrupe, expelled Huub Oosterhuis in 1969. Modernism played a major role in both cases. According to Michael Hurley, S.J., Tyrrell's views were in large part vindicated by the Second Vatican Council. ↑ "The Pope and Modernism", Father Tyrrell's Articles, at The West Australian (Perth, WA), 2 November 1907, p. 2. Also available at Eastern Daily Mail and Straits Morning Advertiser, 5 November 1907, page 1. Chisholm, Hugh, ed. (1911). "Tyrrell, George". Encyclopædia Britannica. 27 (11th ed.). Cambridge University Press. Rigg, James McMullen (1912). "Tyrrell, George". In Lee, Sidney. Dictionary of National Biography, 1912 supplement​. London: Smith, Elder & Co.